Per Fitch: "The proportion of 'A-' and higher ratings in Fitch's global portfolio of sovereigns, corporates and banks remains well below the pre financial-crisis level and could fall further over the next couple of years as the balance of ratings outlooks has deteriorated." 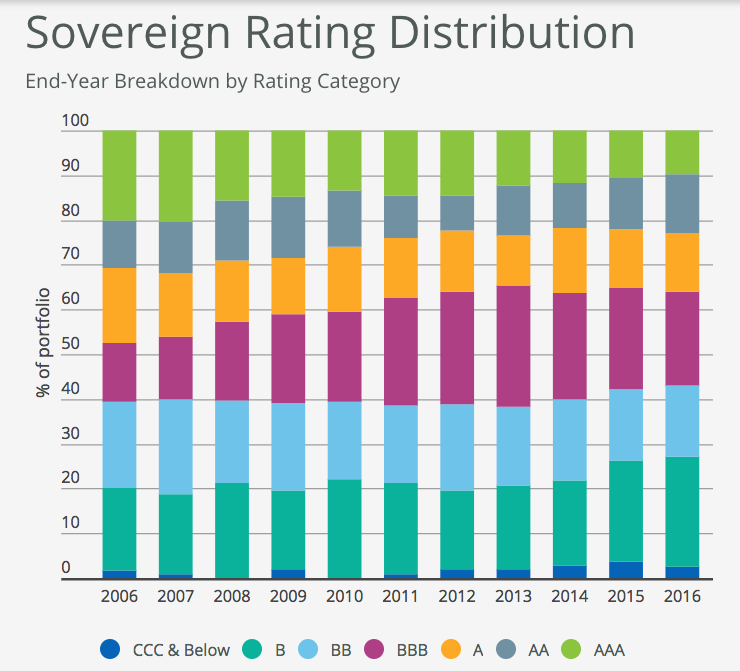 In sovereign ratings, the proportion of 'AAA' sovereigns was down to below 10% at the end of 2016, marking its lowest-ever level. "Around 36% of the portfolio is rated in the 'A' to 'AAA' categories, down from 48% at the end of 2006 while 27% is rated 'B+' or below, compared to 20% in 2006." Fitch's sovereign ratings also "have the greatest share of negative outlooks on a net basis, at 21%. This suggests downgrades could outnumber upgrades by a wide margin" going forward. 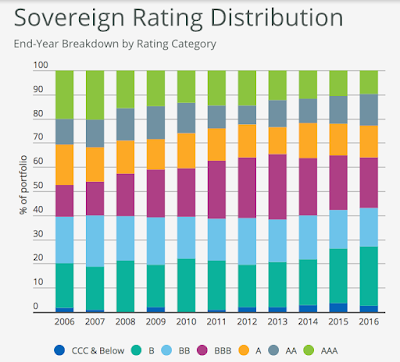 In corporate ratings, "the proportion of corporate ratings in the 'A' to 'AAA' categories has dropped to 20% from 30% over the last decade, but unlike sovereigns the proportion rated 'B+' and below has only ticked up by 1 percentage point. Instead ratings have become increasingly compressed in the 'BB' and 'BBB' categories." "Financial institutions, which have historically had a bigger share of high investment grade ratings, have seen the proportion of 'A' to 'AAA' category ratings slip to 39% from 53%." "The trend seems set to worsen, as a net 11% of financial institution ratings outlooks were negative at end-2016, driven largely by outlooks on emerging-market banks, which themselves often reflect the outlooks of their sovereign."